the first of the stadiums for next year's football World Cup staged a debut match and a party was planned to mark 500 days till kick-off. Instead the country is in mourning, the party cancelled. Early on January 27th a fire in a nightclub, Kiss, in Santa Maria, a university town in the southern state of Rio Grande do Sul, killed 235 people, mainly students. Most of the more than 100 injured are in a critical condition. President Dilma Rousseff, visibly upset, rushed back from a summit in Chile and declared three days of national mourning. A catalogue of negligence caused Brazil's most lethal fire for more than 50 years. It was started by a spark from a flare lit by the band performing in the early hours. That set light to soundproofing foam on the ceiling. Flames spread fast, releasing toxic fumes and short-circuiting the power supply, casting the venue into darkness. Security guards stopped the first to flee, apparently believing they were trying to bunk without paying : in Brazil, club patrons run up tabs and pay on the way out. Police say around 1,000 people were in the club, whose capacity was 690, and that there were no working fire escapes. Most of the deaths were by crushing or asphyxiation. Dozens of bodies were found in the bathrooms, presumably mistaken for exits in the panic. The crush at the door was so severe that firefighters and bystanders had to tear down a wall to get in. 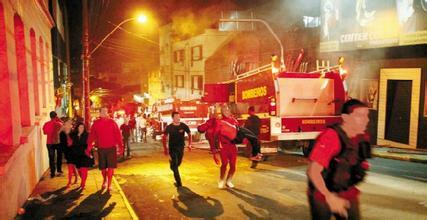 At least Brazilians could take pride in the emergency response. The armed forces airlifted some of the injured to other cities. Hospitals around the country sent specialist equipment, such as respirators : many survivors have damaged lungs. Skin banks in Montevideo and Buenos Aires as well as in Recife and San Paulo, sent supplies for about 20 victims with severe burns. The buck-passing has already started. The public prosecutor said there was " clear evidence" that the club should not have been open : its public-health licence and fire-safety plan had expired. The mayor blamed the fire brigade ; it replied that since the club had applied for an extension, it could keep operating. Investigators want to know how a venue apparently lacking even basic safety precautions had been licensed in the first place. The two owners, and two members of the band whose pyrotechnics started the blaze, have been arrested (one of the owners is in hospital after trying to commit suicide). Similar tragedies elsewhere have led to tougher fire-safety laws. After the Cromanon nightclub fire in Buenos Aires in 2004, which killed 194, the city's venues were closed until they passed new inspections. In the United States many states mandated sprinklers in large new venues and banned indoor pyrotechnics after a nightclub fire in Rhode Island in 2003. In Brazil each state sets its own rules. Some governors have said they will rewrite theirs. A proposal from 2007 to set minimum national standards has idled in Congress; its author now hopes to push it through. Tougher laws will be little use without enforcement, which is the job of mayors. Brazilian businesses are often unregistered, partly to avoid tax but also because much of the paperwork is pointlessly burdensome. Those that do register face delays and sometimes requests for bribes. owners retorted that they had applied in good time but been left waiting, sometimes for years. Eight others appeared not to be registered at all. In a meeting with mayors on January 28th Ms Rousseff asked for their help.
" We have to make sure that tragedies like this are never repeated," she said. Perhaps Brazil is now ready to do what that would take. 例句:I make sure I make time for fishing because it's how I de-stress. 例句:I was in a nightclub in Brixton and a fight broke out. 例句:The laws led to confusion, muddle and years of delay.